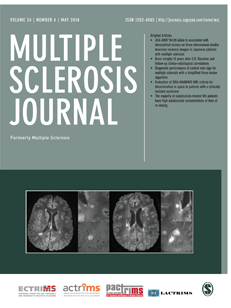 BACKGROUND: Previous studies have postulated an association between dentate nucleus T1 hyperintensity and multiple sclerosis (MS)-related progressive neurodegeneration. Therefore, MS patients have been excluded from most studies investigating brain deposition of gadolinium-based contrast agents (GBCAs). OBJECTIVE: To study the hypothesis that dentate nucleus T1 hyperintensity in MS patients is associated with GBCA administration. METHODS: In a cohort of 97 MS patients, the dentate-to-pons signal intensity ratio (DPSIR) was calculated for 265 consecutive T1-weighted magnetic resonance (MR) scans (including sessions with and without the administration of GBCA). Patients exclusively received either gadopentetate dimeglumine (Gd-DTPA, linear) or gadobutrol (Gd-BT-DO3A, macrocyclic). RESULTS: In patients receiving Gd-DTPA, DPSIR increased significantly between the first and the last scan (+0.009, p < 0.001), and following magnetic resonance imaging (MRI) with Gd-DTPA administration as compared to following an MRI without Gd-DTPA administration (+0.005 vs -0.001; p = 0.022). Additionally, there was a positive linear relationship between the number of Gd-DTPA administrations and the increase in DPSIR ( p = 0.017). No DPSIR increase was observed after Gd-BT-DO3A administration. CONCLUSION: Dentate nucleus T1 hyperintensity in MS patients is associated with Gd-DTPA (but not Gd-BT-DO3A) administration, suggesting an alternative explanation for the association of T1 hyperintensity with disease duration and severity.